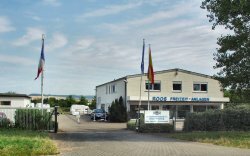 The ROOS Freizeitanlagen GmbH business was founded in 1973. At first it only produced swimming pool systems. However our executive director, Franz Roos, recognised very early on that solar heating systems can significantly increase the pleasures of bathing in one’s own swimming pool. The first solar swimming pool heating systems began operation as early as 1979. To the delight of their owners, their swimming pools are still heated by them to this day. Continuous evaluation and research led to on-going development and improvement of ROOS® Solar SYSTEMS and patents in Germany and other states. The developer Franz Roos placed the greatest emphasis on a large heat output and on the durability of the materials used. "Assembly has to be so easy that even private citizens are in a position to install their own solar swimming pool heating." This aim has been achieved. It has been confirmed by our customers again and again. Today the ROOS Solar SYSTEM is used in many countries around the globe. We continue to work hard on the distribution of this tried and tested system and would be delighted if solar swimming pool heating made by ROOS® was soon bringing much warmth and enjoyment to you too.